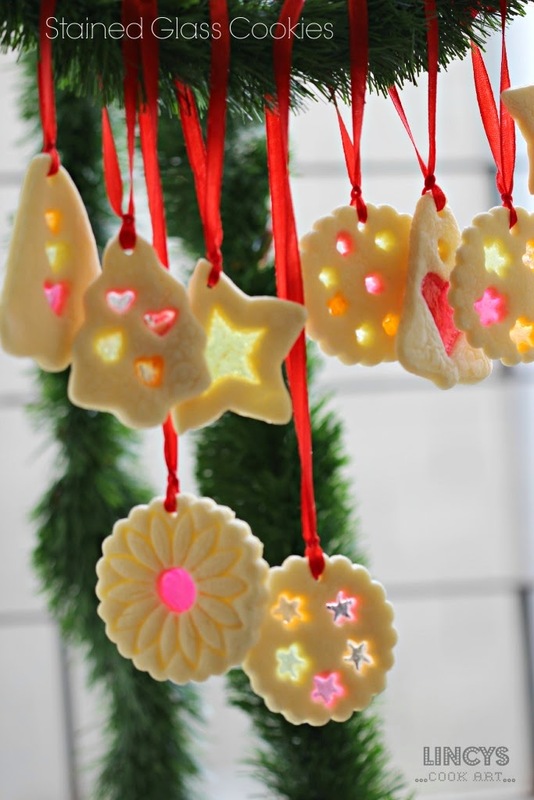 These cookies are wonderful for Christmas especially to hang them in the Christmas tree. They are cheap to make and very appealing cookies than other costly decorations on Christmas tree. Liked by Kids because of the colours and the filled candies. Even adults love these cookies the cookies are crisp and the candy part is bit chewy and so flavourful. I have used mixed falvours in each cookies i could taste all the individual flavours in that cookies. You could used mix of colours/flavours in a single hole too to get different tint for the colours. I have used here green apple, berry, mango and cola flavour for my cookies. You could use the flavours and colour of your choice. Keep the candies inside a polythene bag and crush the candies using a rolling pin. Keep them in separate bowls. Now add the egg yolk (optional) and vanilla essence and beat well. Using a skewer keep a hole on top of all cookies to pass the thread over it and hang later on. Fill the cut holes with desired colour or flavoured crushed candies. Donot over fill the candies. Fill the small holes with powdered candies and big holes with small pieces of candy. Tie with thread and hang on the Christmas tree or tinsel. Such pretty and cute looking cookies :) lovely recipe Lincy. You have taken so much effort for every post hats off. Superb dear.. These look really wonderful.. Hats off to you..